Funeral: 12 Noon – Friday at Mt. Paran Baptist Church with Bro. Robert Rice and Bro. George Abner officiating. additional visitation Friday, from 10 AM until the service hour at 12 noon at the church. Betty Jean Woods, of Buckhorn, Kentucky departed this walk of life on Monday, June 25, 2018 at the age of 73. Betty was born April 13, 1945 in Perry County, Kentucky to the union of the late Johnny and Lois Everidge Estep. She was united in marriage to her beloved husband, George Woods on March 19, 1960 in Saul, Kentucky. Betty was a former cook, employed by the Oneida Baptist Institute, and a former teacher aid, employed by the Perry County School Board. She enjoyed cooking, baking and gardening. 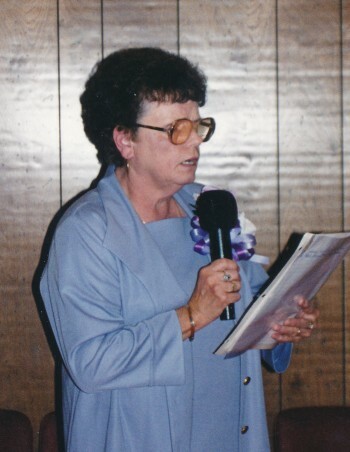 Betty was a devoted member of the Mr. Paran Baptist Church at Saul, Kentucky where she was a Sunday school teacher and song leader. Betty was a devout Christian, a blessed mother, wife, and homemaker. In addition to her parents, Betty was preceded in death by one daughter, Rita Faye Woods; one brother, Benny Estep. Betty leaves behind, her loving and devoted husband of 58 years, George Woods of Buckhorn, KY; one son, Kerry Woods (Glenna) of Saul, KY; three daughters, Sandra Lovins of Oneida, KY, Betty S. Harvey (Ronnie) of Clay Hole, KY, and Lois J. Abner (George) of Saul, KY; three brothers, Donnie Estep (Marlene) of Austin, IN, Earl Estep (Elaine) of Austin, IN, and James Estep of Rising Star, TX; nine cherished grandchildren, Timothy J. Woods (Jennifer), Joshua H. Couch (Jean), Jessica Caudill (Jerry), Georgina Collins, Jeremy Abner (Sheryl), Tonya Gipson, Kelsey Couch, Lindsey Abner, and Ronnie Ray Harvey (Fern); fifteen treasured great-grandchildren, and three great-grandchildren soon to be. A host of other relatives, friends and church family also survive her passing. WOLFE & SONS FUNERAL HOME IN CHARGE OF ARRANGEMENTS.